I can't believe anyone would be surprised by this, but a Tufts University study shows that barn workers are more prone to respiratory infections. From stone dust to sand to shavings to dusty hay and straw, the exposure is pretty much constant for barn workers. Imagine what it's like for the horses! What can you do? Even writing this, it seems like these measures are like putting a firefly in a lighthouse--it's just not enough. 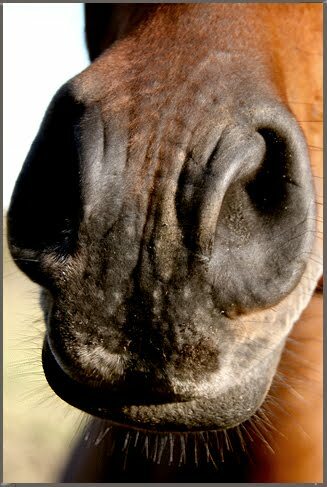 ScienceDaily (Nov. 21, 2009) — The estimated 4.6 million Americans involved in the equine industry may be at risk of developing respiratory symptoms due to poor air quality in horse barns, according to a questionnaire study undertaken earlier this year by investigators at Tufts University's Cummings School of Veterinary Medicine. Very good advice, and just think of the poor horses, living in it day and night. Not feasible where you are, but we opted to build "open stalls" for that very reason (plus the horses really love to be able to see everything). I've been to several barns that were so dim and dusty that I couldn't wait to get out of there! I can only imagine how the horses feel being shut up in there all the time, ugh! My barn has lots of ventilation. It let some snow in over the past two days, but there's no stagnant air, that's for sure. I remember dusty barns in the past...my allergies always kicked up. No wonder. As far as barns go, ours was of the relatively low dust variety. But when I was working in the barn daily, cleaning stalls and grooming...oh man! I developed asthma and had a heck of a time. Lucky that I live in Florida, where we can almost always chuck the horses out of the barn before chores and we were able to keep the barn open to get fresh air in. I can't imagine being closed up in the north during winter months. This is a pet peeve of mine, and one of the few complaints I had about boarding my horse at a great barn with--oh how I wish I still had it now--an indoor arena. The owner heated the place, so it was a trade-off: warmth vs. fresh air. My horse did not live in the barn, but working him in winter meant coming inside--and some days it was almost unbearable. P-U!